Older cattle experience a decline of quality in both their meat and milk, so it's important to know a cow's age before you invest money in her. Learn to tell a cow's age from her teeth to determine how long her useful life on the farm will be. Heifers are born with two or more incisors, and by a month old should have eight. These temporary teeth are replaced one by one as she ages, giving accurate clues to her age. By 1 year old, her permanent two front teeth grow in, becoming fully developed by the time she's 2. The two teeth on either side -- the first intermediates -- grow in during her second year and are developed by age 3. Each year, another set of permanent intermediates emerges until she has a full set of adult teeth at 5 years old. 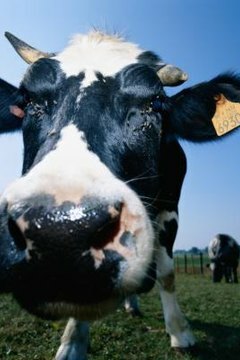 A mature cow has 32 teeth, but only the eight front incisors are used to tell her age. After she has all her adult teeth, estimate age by the amount of wear. By 7 years old, her front middle teeth show noticeable wear. Each year, a subsequent set of incisors will show wear in the order in which they grew in. By 10 years old, her teeth begin to grow in a straight line instead of a rounded arch. The teeth wear into triangular shapes with spaces between them. Estimating age is approximate as cattle grazing on rough range or fed low-quality hay experience more tooth wear than those on green grassy pasture.